The Connectivity Tool of your Linksys Smart Wi-Fi is used to view and change the router's configuration. The information that can be changed are the network name and password, internet settings, local network settings and more. 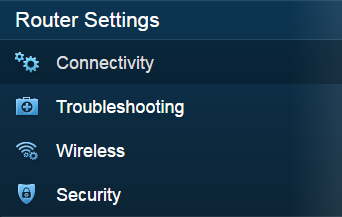 Under the Router Settings menu, click on Connectivity. You can now configure the Connectivity Tool according to your preference. NOTE: Only the latest Linksys Smart Wi-Fi Routers support the VLAN feature. The Basic tab allows you to view and change the router settings. This section shows the current Wi-Fi name/SSID and password used on each band of your router. These are useful when you're connecting computers and devices to the Wi-Fi. The password provides security that prevents unwanted users from accessing your Wi-Fi. NOTE: When you install the router, it automatically creates a Guest network. This feature creates a separate network for guests that will allow computers or devices to have internet connection but will not be able to access the router’s main network and communicate with other devices in the network. To know more, click here. This portion allows you to change the router password, which is used to access the router settings and features such as Guest Access and Parental Controls. For instructions on how to change the router password, click here. Provides the option to update the router firmware automatically when an update is available. Keeping your firmware up-to-date ensures you have the best security and performance from your router. Check the Automatic option to update your router's firmware automatically. If you unselect this option, available updates will be installed only when you click the Check for Updates button. To install a firmware manually, click the Choose File button. Browse and select a specific firmware update file then click the Start button to install the file. Set the current time zone for your area and adjust the time for daylight savings time changes. Specify whether the router port lights are ON or OFF. You may want to turn them OFF if the lights are visible and a distraction. The Internet Settings tab allows you to configure the router to work with your internet connection. Your router ships with the most common settings and several settings are configured during setup. You may never have to change any of these settings. If you do need to change them, contact your Internet Service Provider (ISP) for assistance. Settings are available for IPv4 and IPv6. Automatic Configuration - DHCP – Select this if your ISP assigns IP Addresses dynamically, meaning you get different IP Addresses each time you start your computer. Static IP – Select this if you're required to use the same IP Address each time you connect to the internet. If so, enter the information for your internet address, subnet mask, default gateway and DNS entries provided by your ISP. For more information about configuring your router with Static IP, click here. PPPoE – Select Point-to-Point Protocol over Ethernet (PPPoE) if your ISP uses this method to establish internet connection. PPPoE allows ISPs to manage accounts via username and password. PPTP – Select this to use the Point-to-Point Tunneling Protocol (PPTP). This enables the secure transfer of data from a remote client to a private enterprise server by creating a Virtual Private Network (VPN) across TCP/IP-based data networks. L2TP – Select this to use the Layer 2 Tunneling Protocol (L2TP). This combines Layer 2 Forwarding (L2F) and Microsoft's Point-to-Point Tunneling Protocol (PPTP) protocols. Bridge Mode – Select this to use Bridge Mode if your ISP requires it. You can choose to obtain an IP Address automatically or enter the information for your internet address, subnet mask, default gateway and DNS entries. This information is provided by your ISP. NOTE: Some Linksys Smart Wi-Fi Routers support Wireless Repeater and Wireless Bridge modes. To know more about the Wireless Repeater mode, click here. For Wireless Bridge, click here. These are optional settings you can configure on your router. Domain name – This displays the domain name for the router. Some ISPs, usually cable ISPs, require this as identification. You may have to check with your ISP to see if your broadband internet service has been configured with a domain name. Provides the option to use the same MAC Address for your computer or router and not get a new one from your ISP. IPv6 is the "next generation" Internet Protocol (IP) standard. It replaces IPv4, the internet protocol currently used most extensively throughout the world. IPv6 supports a much larger address space and helps to enable new types of applications for communication and collaboration. NOTE: To learn how you can configure the IPv6 on the Linksys Smart Wi-Fi Routers, click here. IPv6 Automatic – Select this to use Native IPv6. DUID – The device user identification assigned by the router. 6rd tunnel – Select this to use 6rd Tunnel. Prefix – The prefix address used for the tunnel, provided by your ISP. Prefix length – The prefix length used for the tunnel. Border relay – The border relay address used for the tunnel. IPv4 mask length – The IPv4 Address mask length used for the tunnel. Domain name – This displays the domain name for the router. Some ISPs, usually cable ISPs require this as identification. You may have to check with your ISP to see if your broadband internet service has been configured with a domain name. MTU – Maximum Transmission Unit (MTU) specifies the largest packet size permitted for internet transmission. Select Manual if you want to manually enter the largest packet size that is transmitted. To have the router select the best MTU for your internet connection, keep the default setting to Auto. The Local Network settings allow you to configure the router to work with your internet connection. Host name – This is the router's name. IP address – This is the router's IP Address. QUICK TIP: You may be able to change this address but you will have to reconnect devices currently connected to your router. For more information on changing the router's IP Address, click here. Subnet mask – This is the router's subnet mask. It's used to divide a network into subnets so information can be routed correctly to your computers and devices. Your ISP will provide you with the subnet mask setting needed here. Dynamic Host Configuration Protocol (DHCP) is by default enabled on your router. DHCP assigns IP Addresses to computers and devices on your network as needed. Start IP address – This is the starting IP Address given to the first device that connects to the network. Maximum number of users – This is the total number of devices that can connect to your router. This number can't be greater than 253 and its default is 50. IP address range – The available IP Addresses that can be used on the network. Client lease time – The amount of time (in minutes) a network user is allowed to connect to the router with their current IP Address. When the time has expired, the user will be automatically assigned a new IP Address, or the lease will be renewed. Static DNS 1-3 – Domain Name System (DNS) is how the internet translates a domain or website name into an internet address or URL that you can access. Your ISP will provide at least one DNS server IP Address. You can enter up to three. WINS – The Windows Internet Name Service (WINS) is responsible in managing each computer's interaction with the internet. If you use a WINS server, enter that server's IP Address here. Otherwise, leave this blank. Network Address Translation (NAT) allows the router to modify packets to allow multiple devices to share a single IP Address. Select this option to enable NAT. Use this option to assign a specific IP Address, subnet mask and gateway address to a specific device. To add a route, click the Add static route button, then enter the device name and the information to use for that device and click Save. To change information for a device, click Edit. To establish a connection to the internet, some ISPs require Virtual LAN (VLAN) to be enabled on your Linksys Smart Wi-Fi Router. 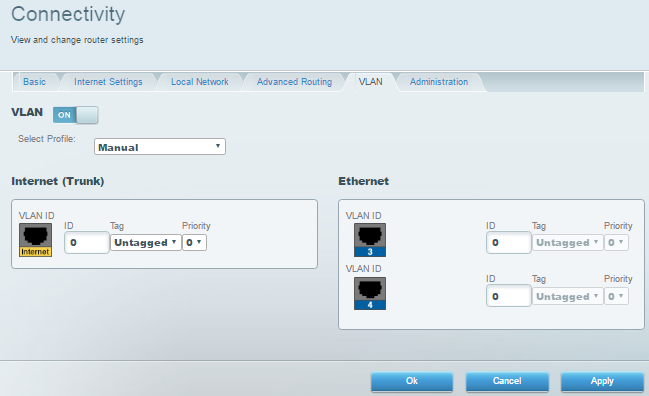 For step-by-step instructions on how you can configure the VLAN settings, click here. NOTE: Only the latest Linksys Smart Wi-Fi Routers support this feature. HTTP/HTTPS - Use HTTP only, or select HTTPS to also use SSL (Secure Socket Layer) to encrypt data transmitted for higher security. Both HTTP and HTTPS are selected by default. Access via wireless - Select this to allow wireless access to your network. Universal Plug and Play (UPnP) allows devices connected to a network to discover each other and automatically create working configurations. Examples of UPnP-capable devices include web cameras, online gaming applications and VoIP devices. UPnP is enabled by default. Select whether to allow users to change router settings or disable your local internet connection while using UPnP. Select this to allow SIP (Session Initiation Protocol) packets. This is used by some VoIP service providers to go through your router's firewall. Enabling the Express Forwarding feature can increase router performance as it bypasses protocols that add extra overhead to router processing such as packet level inspections, sorting, filtering and queuing. AllJoyn® is an open, secure technology that allows AllJoyn-enabled devices on your network to discover, connect and interact directly with each other. If you turn on the notifications, your router will send notifications to AllJoyn-enabled devices on your network whenever a device is connected. The ability to receive the notifications and the notifications utility will be dependent on each devices’ configuration and software capability. NOTE: This feature is only available on the Linksys EA7500 model. The Linksys Smart Wi-Fi‘s main objective is to provide the best experience to your home network. Connecting of Wi-Fi devices such as smartphones, tablets, gaming consoles, cameras and wireless printers to the internet has been made a lot easier. To learn how to connect your devices to your home network, click here.